Cairo (pronounced /ˈkaɪroʊ/ (deprecatit template); Arabic: القاهرة‎ al-Qāhira, literally "The Vanquisher" or "The Conqueror") is the caipital o Egyp, the lairgest ceety in Africae an the Arab Warld, an ane o the maist densely populatit ceeties in the warld. Nicknamed "The Ceety o a Thoosan Minarets" for its preponderance o Islamic airchitectur, Cairo haes lang been a centre o the region's poleetical an cultural life. Even afore Cairo wis established in the 10t century, the land composin the present-day ceety wis the site o naitional caipitals whose remnants remain visible in pairts o Auld Cairo. Cairo is an aa associatit wi Auncient Egyp due tae its proximity tae the Great Sphinx an the pyramids in adjacent Giza. Egyptians the day aften refer tae Cairo as Maṣr (Arabic:مصر), the Arabic pronunciation o the name for Egyp itsel, emphasizin the ceety's continued role in Egyptian influence. Cairo haes the auldest an lairgest film an muisic industries in the Arab Warld, as well as the warld's seicont-auldest institution o hichter learnin, al-Azhar University. Mony internaitional media, businesses, an organisations hae regional heidquarters in the ceety, an the Arab League haes haed its heidquarters in Cairo for maist o its existence. Cairo is locatit in northren Egyp, kent as Lawer Egyp, 165 kilometers (100 mi) sooth o the Mediterranean Sea an 120 kilometers (75 mi) wast o the Gulf o Suez an Suez Canal. The ceety is alang the Nile River, immediately sooth o the pynt whaur the river leaves its desert-bund valley an branches intae the law-lyin Nile Delta region. Awtho the Cairo metropolis extends away frae the Nile in aw directions, the ceety o Cairo resides anerlie on the east bank o the river an twa islands athin it on a tot aurie o 453 square kilometers (175 sq mi). The river Nile flows throu Cairo, here contrastin auncient customs o daily life wi the modren ceety o the day. Till the mid-19t century, when the river wis tamed bi dams, levees, an ither controls, the Nile in the vicinity o Cairo wis heichlie susceptible tae chynges in course an surface level. Ower the years, the Nile gradually shiftit wastward, providin the site atween the eastren edge o the river an the Mokattam hielands on which the ceety nou staunds. The land on which Cairo wis established in 969 (present-day Islamic Cairo) wis locatit unnerwater juist ower three hunder years earlier, when Fustat wis first biggit. Law periods o the Nile durin the 11t century continued tae add tae the landscape o Cairo; a new island, kent as Geziret al-Fil, first appeared in 1174, but eventually became connectit tae the mainland. The day, the site o Geziret al-Fil is occupied bi the Shubra destrict. The law periods creatit anither island at the turn o the 14t century that nou composes Zamalek an Gezira. Land reclamation efforts bi the Mamluks an Ottomans further contributit tae expansion on the east bank o the river. Acause o the Nile's movement, the newer pairts o the ceety – Garden Ceety, Cairo Ceety Centre, an Zamalek – are locatit closest tae the riverbank. The auries, which are hame tae maist o Cairo's embassies, are surroondit on the north, east, an sooth bi the aulder pairts o the ceety. Auld Cairo, locatit sooth o the centre, haulds the remnants o Fustat an the hert o Egyp's Coptic Christian community, Coptic Cairo. The Boulaq destrict, which lies in the northren pairt o the ceety, wis born oot o a major 16t-century port an is nou a major industrial centrer. The Citadel is locatit east o the ceety centre aroond Islamic Cairo, which dates back tae the Fatimid era an the foondation o Cairo. While wastren Cairo is dominatit bi wide boulevards, open spaces, an modren architecture o European influence, the eastren hauf, haein grown haphazardly ower the centuries, is dominatit bi sma lanes, croudit tenements, an Islamic architecture. Northren an extreme eastren pairts o Cairo, which include satellite touns, are amang the maist recent additions tae the ceety, as thay developed in the late-20t an early-21st centuries tae accommodate the ceety's rapid growthe. The wastren bank o the Nile is commonly includit athin the urban aurie o Cairo, but it composes the ceety o Giza an the Giza Govrenorate. Giza haes an aa unnergane significant expansion ower recent years, an the day the ceety, awtho still a suburb o Cairo, haes a population o 2.7 million. The Cairo Govrenorate is juist north o the Helwan Govrenorate, which wis creatit in 2008 when some o Cairo's soothren destricts, includin Maadi an New Cairo, wur split aff an annexed intae the new govrenorate. Cairo is an aa in ivery respect the centre o Egyp, as it haes been amaist syne its foondin in 969 AD. The majority o the naition's commerce is generatit thare, or passes throu the ceety. The great majority o publishin hooses an media ootlets an nearly aw film studios are thare, as are hauf o the naition's hospital beds an varsities. This haes fueled rapid construction in the ceety—ane biggin in five is less nor 15 years auld. This astonishin growthe til recently surged well aheid o ceety services. Hames, roads, electricity, telephone an sewer services wur aw suddent in short supply. Analysts tryin tae grasp the magnitude o the chynge coined terms lik "hyper-urbanization". Tahrir Square wis foondit durin the mid 19t century wi the establishment o modren doun-toun Cairo. It wis first named Ismailia Square, efter the 19t-century ruler Isma'il Pasha, who commissioned the new dountoun destrict's 'Paris on the Nile' design. Efter the Egyptian Revolution o 1919 the square became widely kent as Tahrir (Liberation) Square. Several notable biggins surroond the square includin, The American University in Cairo's dountoun campus, the Mogamma govrenmental admeenistrative biggin, the heidquarters o the Arab League, the Nile Ritz Carlton Hotel, the heidquarters o the Naitional Democratic Pairty, an the Egyptian Museum. Bein at the hert o Cairo, the square witnessed several major protests ower the years. Housomeivver, the maist notable event in the square wis bein the focal pynt o the Egyptian Revolution o 2011 against umwhile preses Hosni Mubarak. The Museum o Egyptian Antiquities, kent commonly as the Egyptian Museum, is hame tae the maist extensive collection o auncient Egyptian antiquities in the warld. It haes 136,000 items on display, wi mony mair hunders o thoosans in its basement storerooms. Khan el-Khalili is an auncient bazaar, or mercatplace. It dates back tae 1382, when Emir Djaharks el-Khalili biggit a lairge caravanserai, or khan. A caravanserai is a hotel for traders, an uisually the focal pynt for ony surroondin aurie. The caravanserai remains the day. The pairt o Cairo that contains Coptic Cairo an Fostat, which contains the Coptic Museum, Babylon Fortress, Hangin Kirk, the Greek Kirk o St. George, mony ither Coptic kirks, the Ben Ezra Synagogue an Amr ibn al-'As Mosque. The Cairo Touer is a free-staundin concrete TV touer in Cairo. 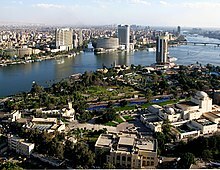 It staunds in the Zamalek destrict on Gezira Island in the Nile River, in the ceety centre. At 187 meters, it is 43 metres heicher than the Great Pyramid o Giza, which staunds some 15 km tae the soothwast. Established in 972, Al-Azhar mosque wis historically the site o the renouned Al-Azhar University, till the varsity's muive in the late 20t century tae a new campus in Nasr Ceety. The toun centre o Cairo, seen fae the Cairo touer. ↑ "World's Densest Cities". Forbes. 21 December 2006. Retrieved 27 October 2010. ↑ 7.0 7.1 Brinkhoff, Thomas. "Egypt: Governorates & Cities". City Population. Retrieved 12 September 2009. ↑ Leila, Reem (24–30 April 2008). "Redrawing the Map" (894). al-Ahram Weekly. Retrieved 12 September 2009. ↑ "Arab American Vehicles Co". Aav.com.eg. Retrieved 2010-06-14. ↑ "Welcome to MCV Web Site". Mcv-eg.com. Retrieved 2010-06-14. ↑ TradeHolding.com B2B Network. "Panda, Buy from Mod Car. Egypt - Ash Sharqiyah - Middle East Business B2B Directory - Saudi Arabia, UAE, Bahrain Companies, Middle East Businesses, Products & Trade Leads, Arab Business". Gulfbusiness.tradeholding.com. Retrieved 2010-06-14. ↑ "Seoudi Group 1001 opportunities for investment in Egypt and Arab World". Seoudi.com. Retrieved 2010-06-14. ↑ "اسبرانزا ايجيبت". Speranza Egypt. Retrieved 2010-06-14. ↑ "Welcome to Daewoo Motor Website". Aboulfotouh.com. Retrieved 2010-06-14. ↑ "Sister city agreements". Cairo Governorate. Retrieved 23 September 2010. ↑ "New York City Global Partners". The City of New York. 2010. Retrieved 27 January 2010. Wikimedia Commons haes media relatit tae Cairo. This page wis last eeditit on 10 Mairch 2018, at 18:45.